They loved what we did. We loved doing it. Now, over 750 hand-made, custom-designed hidden doors later, it's our sole specialty. We treat each project as though it's the only one of its kind, because it is. Our reputation is built on design ingenuity, exquisite workmanship and first-rate customer service. Secret doors have been around for thousands of years - in Eqyptian pyramids, medieval castles and country manors. But they're hardly a thing of the past. More and more people with originality and taste are discovering the value of a hidden door: not just an original touch, but as a highly functional one. Imagine for a moment: where might you put a master-crafted hidden door in your house? The possibilities are endless. Transform an awkwardly situated doorway into an elegant cabinet. Convert that odd little area under the stairway into a bookcase. Conceal objects of value behind an entertainment center. Or what about making better use of space in your pantry, walk-in closet, bedroom closet, concealing your attic entry, basement entry, home theatre or your audio visual equipment and so much more. 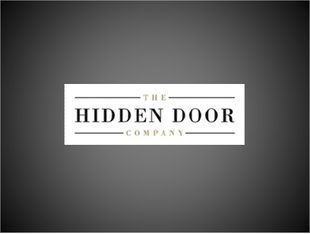 The Hidden Door Company's work stands apart in many crucial ways: concealment, craftsmanship, customer service, knowledge and expertise. You'll see the hand of our master craftsman in every detail. Each door, whether two feet or ten feet wide, is pre-hung for ease and accuracy of installation. Our customer service is one-of-a-kind in the industry. We give you weekly progress reports, revisable drawings, access to our shop manager, and much more. Our expert team will make sure your experience is positive, from the first sketch to delivery and beyond. Additionally, due to the sensitive nature of hidden doors your personal information is never shared with any other parties and remains confidential forever. To request a quote please go to the "Request a Quote" page.